Oclusión y función oclusal en el adulto mayor. masticación, deglución, fonética y estética. Todas ellas relacionadas de alguna forma con los dientes y la función oclusal. Sin embargo, hoy la O. en los AM tiene una remarcable función, porque es considerada como un verdadero predictor de salud general y bucal; cuanto mayor es la cantidad de unidades masticatorias, es mejor. La calidad de la oclusión se relaciona incluso con la circulación cerebral, memoria, deficiencias cognitivas, etc. Muchas investigaciones están vinculadas con evaluación de índices de salud bucal en los ancianos (GOHAI) y las actividades de la vida diaria (ADL). Por otra parte el estado de salud bucal de los adultos mayores debe hacer tomar decisiones al odontólogo, para evitar esas condiciones en declinación. Por ejemplo, una enfermedad periodontal, puede decidir el angostamiento de la rehabilitación O en sentido V-L, de piezas individuales como de puentes; así como también en prótesis removible, se deben seleccionar dientes artificiales más angostos (V-L) en rebordes alveolares finos. En ambos casos anteriores, el propósito es evitar tratamientos iatrogénicos. La ausencia de O o sus malas condiciones pueden incluso desencadenar una disquinesia orofacial. Gerodontología, Facultad de Odontología, Universidad de la Republica. Especialista en Gerodontología y Prostodoncia, Facultad de Odontología, Universidad de la Republica. Akifusa S, Soh I, Ansai T, Hamasaki T, Takata Y, Yohida A, Fukuhara M, Sonoki K, Takehara T. (2005). Relationship of number of remaining teeth to health-related quality of life in community-dwelling elderly. Gerodontology; 22(2): 91-97. Allen PF, Witter DJ, Wilson NH. (1995). The role of the shortened dental arch concept in the management of reduced dentitions. Br Dent J; 179(9): 355-357. Atchinson KA, Dolan TA. (1990). Development of the Geriatric Oral Health Assessment Index (GOHAI). J Dent Educ; 54(11): 680-687.
edentulous postmenopausal women. Ann Periodontol; 3(1): 322-326. Budtz-Jorgensen E. (1999). Prosthodontics for the Elderly. Diagnosis and treatment. Chapter 5. Prosthodontic treatment planning for the frail or dependent elderly. Legal and ethical considerations. Illinois : Quintessence. pág. 117.
homebound elders: reliability, sensitivity and specificity. Special Care Dent; 19(5): 214-219. Cherruau M, Buch D. (2001). Problématiques liées aux modifications de l’appareil manducateur avec l’ âge : influence sur les traitements prothétiques. Actual Odontostomatol (Paris); (214): 177-188. Garrett NR, Kapur KK, Perez P. (1996). Effects of improvements of poorly fitting dentures and new dentures on masticatory performance. J Prosthet Dent; 75(3): 269-75. Garrett NR, Perez P, Elbert C, Kapur KK. (1996). Effects of improvements of poorly fitting dentures and new dentures on masseter activity during chewing. J Prosthet Dent; 76(4): 394-402. Garrett NR, Kapur KK, Jochen DG. (1994). Oral stereognostic ability and masticatory performace in denture wearers. Int J Prosthodont; 7(6): 567-573. Grasso JE, Catalanatto FA. (1979). The effects of age and full palatal coverage on oral stereognotic ability. J Prosthet Dent; 41 (2): 215-19. Hämäläinen P, Rantanen T, Keskinen M, Meurman JH. (2004). Oral health status and change in handgrip strength over 5-year period in 80-year-old people. Hayakawa I, Hirano S, Takahashi Y, Keh ES. (2000). Changes in the masticatory function of complete denture wearers after relining the mandibular denture with a soft denture liner. Int J Prosthodont; 13(3): 228-231.
and radiographic findings in the elderly. Int J of Prosthodont; 16(6): 631-34. Hirai T, Ishijima T, Koshino H, Anzai T. (1994). Age-related change of masticatory function in complete denture wearers: evaluation by a sieving method with peanuts and a food intake questionnaire method. Int J of Prosthodont; 7(5): 454-460. Idowu AT, Handelman SL, Graser GN. (1987). Effect of denture stability, retention, and tooth form on masticatory function in the elderly. Gerodontics; 3(4): 161-164. Knezoviæ-Ziatariæ D, Celebiæ A. (2003). Mandibular bone mineral density changes in complete and removable partial denture wearers: a 6-month follow-up study. Int J Prosthodont; 16(6): 661-665. Liedberg B, Stoltze K, Owall B. (2005). The masticatory handicap of wearing removable dentures in elderly men. Mascarenhas AK. (1999). A comparison of oral health in elderly populations seeking and not seeking dental care. Special Care in Dent; 19(6): 248-253. McMillan AS, Wong MC. (2004). Emocional effects of tooth loss in a community-dwelling elderly people in Hong Kong. Int J Prosthodont; 17(2): 172-176. Miura H, Yamasaki K, Kariyasu M, Miura K, Sumi Y. (2003). Relationship between cognitive function and mastication in elderly females. J Oral Rehab; 30(8): 808-811. Miura H, Kariyasu M, Yamasaki K, Arai Y, Sumi Y. (2005). Relationship between general health status and the change in chewing ability: a longitudinal study of the frail elderly in Japan over a 3-year period. Gerodontology; 22(4): 200-205. Miyazaki H, Motegi E, Yatabe K, Yamaguchi H, Maki Y. (2005). A study of occlusion in elderly Japanese over 80 years with at least 20 teeth. Gerodontology; 22(4): 206-210. Müller F, Heath MR, Ott R. (2001). Maximum bite force after the replacement of complete dentures. Gerodontology;18(1): 58-62. Nakata M. (1998). Masticatory function and its effects on general health. Int Dent J; 48: 540-548. Nisizaki S. (2007). Impacto del perfil psicológico en la asistencia odontológica del adulto mayor. En: Envejecimiento, memoria colectiva y construcciones de futuro. Montevideo: Psicolibros. Okimoto K, Matsuo K, Hayashi M, Terada Y. (1999). Oral ADL in the elderly. Dent Japan;35: 57-60. Owen PC. (2004). Appropriatech: prosthodontics for the many, not just for the few. Int J Prosthodont; 17(3): 261-262. Roumanas ED, Garrett NR, Hamada MO, Kapur KK. (2003). Comparisons of chewing difficulty of consumed foods with mandibular conventional dentures and implant-supported overdentures in diabetic denture wearers. Int J Prosthodont; 16(6): 609- 615. Sadamori S, Hamada T, Nakai N, Nishimura M. (2004). Influence of denture wearing on the stage of dementia and ADL of the elderly with severe dementia – a two-year follow-up study in a dementia ward in a mental hospital. Dent Japan; 40: 163-167. Shimazaki Y, Soh I, Saito T, Yamashita Y, Koga T, Miyazaki H, Takehara T. (2001). Influence of dentition status on physical disability, mental impairment and mortality in institutionalized elderly people. J Dent Res; 80(1): 340-45. Slade GD. (1997). Derivation and validation of a short-form Oral Health Impact Profile (OHIP). Community Dent Oral Epidemiol;25 (4): 284-290. Slade GD, Spencer AJ. (1994). Development and evaluation of the Oral Health Impact Profile (OHIP). Community Dent Health; 11(1): 3-11. Slade GD, Spencer AJ. (1994). Social impact of oral conditions among older adults. Aust Dent J;39(6): 358-364. Suzuki T, Kumagai H, Watanabe T, Uchida T, Nagao M. (1997). Evaluation of complete denture occlusal contacts using pressure-sensitive sheets. Int J Prosthodont; 10(4): 386-391. Morneburg TR, Pröschel PA. (2003). In vivo forces on implants influenced by occlusal scheme and food consistency. Int J of Prosth; 16(5): 481-486. Thomason JM, Lund JP, Chehade A, Feine JS. (2003). Patient satisfaction with mandibular implant overdentures and conventional dentures 6 months after delivery. Int J Prosthodont; 16(5): 467- 473. Trulsson M, Gunne HS. (1998). Food-holding and biting behaviour in human subjects lacking periodontal receptors. J Dent Res 1998; 77(4): 574-582. Umeda K, Sawaki Y, Kato T, Usami T, Ueda M, Nabeshima T. (1995). Effect of tooth loss on spatial learning and memory abilities in adult rats: implications for central acetylcholine. Biogen Amines;11(3): 225-233.
van Aken AA, van Waas MA, Kalk W, van Rossum GM. (1991). Differences in oral stereognosis between complete denture wearers. Int J Prosthodont; 4(1): 75-79. Veyrune JL, Tubert-Jeannin S, Dutheil C, Riordan PJ. (2005). Impact of new prostheses on the oral health related quality life of edentulous patients. Gerodontology; 22(1): 3-9. Watanabe K, Mizokami T. (1997). Studies on the effects of the spillway on the occlusal table of complete dentures upon the bearing of masticatory force. Bull Tokyo Dent Coll; 38(2): 77-86. Yoshida M, Morikawa H, Yoshikawa M, Tsuga K, Akagawa Y. (2005). Eight-year mortality associated with dental occlusion and denture use in community-dwelling elderly persons. Gerodontology; 22(4): 234- 237. Yoshihara A, Watanabe R, Nishimuta M, Hanada N, Miyazaki H. (2005). The relationship between dietary intake and the number of teeth in elderly Japanese subjects. Gerodontology; 22(4): 211-218. NISIZAKI, Susumu. Oclusión y función oclusal en el adulto mayor.. Actas Odontológicas (Publicación discontinuada), [S.l. ], v. 6, n. 1, p. 57-67, apr. 2016. ISSN 2393-6304. 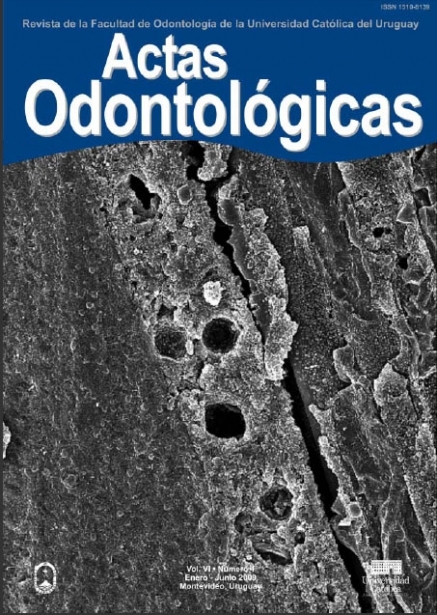 Disponible en: <http://revistas.ucu.edu.uy/index.php/actasodontologicas/article/view/1088>. Fecha de acceso: 21 apr. 2019 doi: https://doi.org/10.22235/ao.v6i1.1088.